We offer the highest-quality roll-up signs and stands available in a variety of styles and colors (Mesh or Vinyl) with standard highway legends or emergency messages. Or they can be custom made, with your own silhouette-style logo, design and wording. (A one-time screen set-up charge of $60 applies to custom legends for Fold & Roll or Marathon type roll-ups only). Our roll-up signs are light-weight and designed for visibility, durability and flexibility with limited storage space in mind. Available colors: Non-Reflective Orange, or Reflective Fluorescent Orange, Yellow, White, Yellow-Green (Lime) or Pink (Coral). They come as diamond-shaped 36- or 48-inch signs or Red-and-White octagons (for STOP signs) and rectangles for other construction-related messages, such as Black-on-White for ROAD CLOSED signs. Choose any standard message and color combination. Designed for fast set-up and take-down and compact storage. Each is manufactured with quality vinyl sheeting made by Reflexite or 3M, the largest makers of roll-up sign material in the world. Every roll-up sign comes with a pair of strong, solid Orange fiberglass rib supports (1/4 to 3/16-inch thick and 1 1/8-inch wide) and can be attached to most sign stands on the market with roll-up sign brackets. The latest addition to our roll-up lineup is Fluorescent Pink, designed for high visibility for Incident Management, including accident and other emergency first-responders: Police, fire, emergency medical and department of transportation personnel. The stand-out Pink color is also used in Homeland Security training exercises and emergencies. 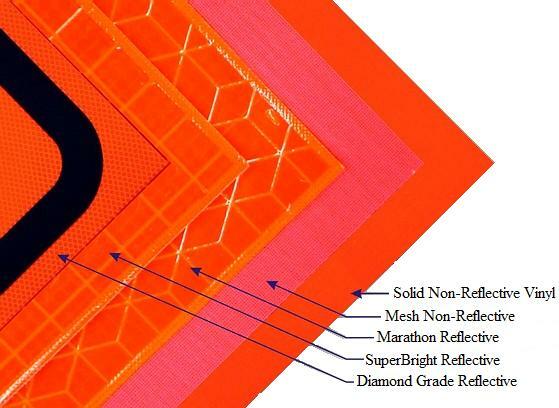 The Coral-colored signs are made of durable, flexible reinforced microprism retroreflective sheeting, and meet criteria outlined in the federal sign manual, the Manual on Uniform Traffic Control Devices. Vinyl-coated Non-Reflective Orange nylon with open-weave mesh. Day use only. Durable 18-ounce re-enforced vinyl in Non-Reflective Orange. Day use only. day or night use. Available in Fluorescent Orange or Lime for high visibility. Includes Gray backing. Delta horizontal pockets (left, first photo) are designed with three rivet points for strength, have a shallow depth for easier deployment and narrow shape for compact storage. Our fiberglass rib supports are riveted in the center to prevent tightening or loosening over time, a characteristic of inferior nut-and-bolt assembly type roll-up sign design. (A complete list of standard legends for roll-up signs is shown at the bottom of this page). Attaches to sign with Velcro. Choose any message – standard or custom. Note: Standard roll-up sign legends are shown below with capital letters for word signs and lower-case letters for symbol-type signs. Custom messages and symbols available free, except for Fold & Roll or Marathon roll-ups, where a one-time $60 setup charge applies. TRUCKS ENTERING AND LEAVING HWY.